Another beautiful fall day to enjoy a bicycle ride along the trail. 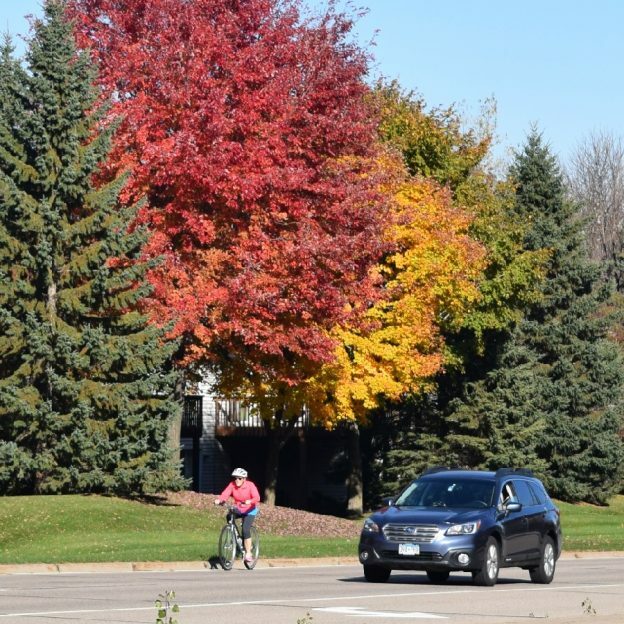 Here in this photo, taken a little over a week ago, a cyclist is riding along the Greenway Trail in Minneapolis, MN when the colors were at there peak. This entry was posted in News and tagged #bicycle, #bikeminneapolis, #bikerchicks, #bikergirl, #biketrails, #fallcolors, #nextadventure, #nextbikeadventure, #onlyinMN, bike, Midtown Greenway, Minnesota fall colors, Minnesota trails, MN trails on November 12, 2016 by Russ Lowthian. For late October, another top ten biking day in the upper Midwest. Here in this photo cyclists enjoy riding along the Mississippi River Trail in the Twin City Area of Minnesota. This entry was posted in News and tagged #bicycle, #fallcolors, #nextadventure, #nextbikeadventure, #onlyinMN, bike, Minnesota bike maps, Minnesota fall colors, Minnesota trails, Mississippi River Trail, MN trails on October 28, 2016 by Russ Lowthian. Fall colors are still prevalent in parts of Southern Minnesota making this part of the state great for some more picture-perfect memories on your bike. See more details here. With the leaves turning and perfect biking weather, we hope you get out on your bike and enjoy all the fall riding possibilities and Halloween Decorations in Minnesota. See many more bike-friendly places to explore in the new Minnesota Bike/Hike Guide. Thanks for viewing the Fall Colors Pic of the Day. This entry was posted in News and tagged #fallcolors, #nextadventure, #nextbikeadventure, #onlyinMN, Minnesota bike maps, Minnesota fall colors, Minnesota trails, Mississippi River Trail, MN trails, Southern Minnesota on October 27, 2016 by Russ Lowthian. A colorful fall weekend and another #top-ten-weather-day to get out on the bike and make some new autumn memories while the leaves are at there peak. 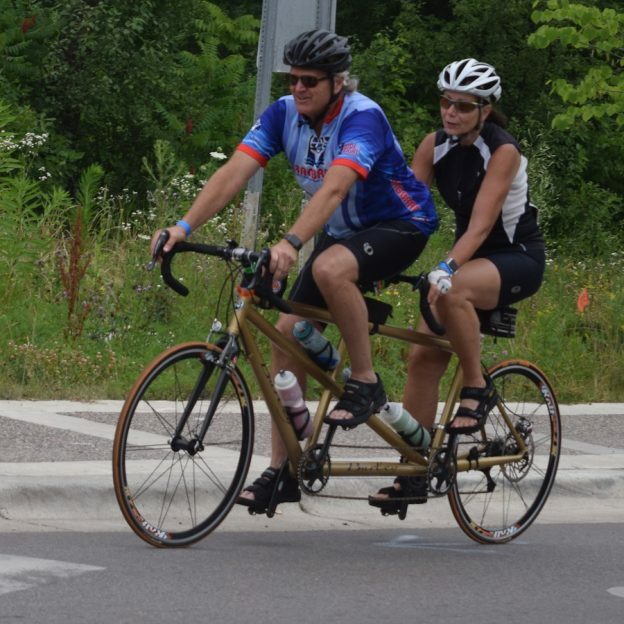 Here, in this photo, a couple, on a tandem bike is retracing some of the Minnesota Ironman Bike Ride routes from this last spring, near Stillwater, MN. 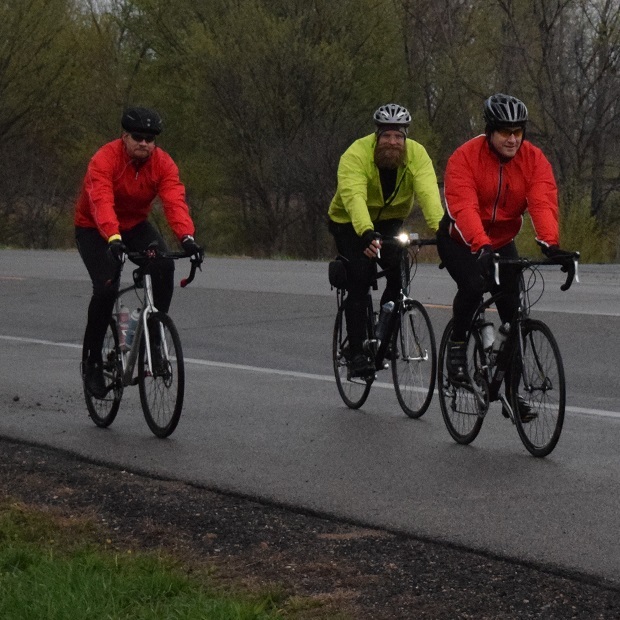 The 51st MN Iroman bike ride is April 30th, 2017. Rumor has it there will be new routes. Where will they be? With the leaves turning and perfect biking weather, we hope you get out on your bike and enjoy all the fall riding possibilities in Minnesota. See many more bike-friendly places to explore in the new Minnesota Bike/Hike Guide. Thanks for viewing the Fun Colorful Fall Weekend Pic of the Day. This entry was posted in News and tagged #discoverstillwater, #fallcolors, #nextadventure, #nextbikeadventure, #onlyinMN, #toptenweatherday, Minnesota bike maps, Minnesota fall colors, Minnesota Ironman Bike Ride, Minnesota trails, MN trails, Stillwater MN on October 22, 2016 by Russ Lowthian. Another colorful fall weekend to get out on the bike with the family and make some autumn memories while the leaves are at there peak. 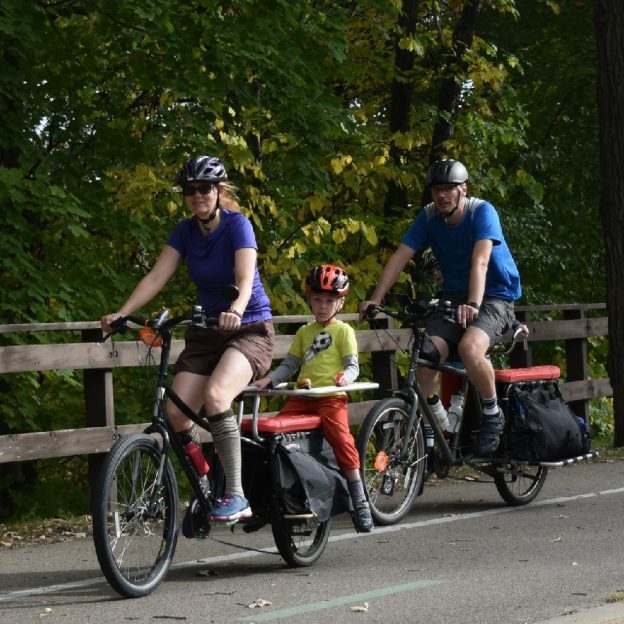 In this photo, a family rides along the Mississippi River Trail in the Twin City Metro Area. With the leaves turning and perfect biking weather we hope you get out on your bike and enjoy all the fall riding possibilities in Minnesota. See many more bike friendly places to explore in the new Minnesota Bike/Hike Guide. This entry was posted in News and tagged #fallcolors, #nextadventure, #nextbikeadventure, #onlyinMN, Minnesota bike maps, Minnesota fall colors, Minnesota trails, Mississippi River Trail, MN trails on October 21, 2016 by Russ Lowthian. Bike riding in fall can come with many challenges. However, it can also be immensely rewarding. While bicycle season is winding down for some, for many other cyclists their two wheels are a favorite mode of transportation to explore the great autumn landscape. Pedaling along the colorful autumn roads or trails is so breathtaking that I will admit that fall bike riding is one of my favorite times to ride. Not too hot, not too cold, and there are less insects once the first frost hits. If you’re planning to ride around this fall, check out these top tips before heading out. For fall bike riding layering your clothing is key. The temperature fluctuation can be really confusing when you want to get dressed and go biking. The morning can look like 47 or 48 degrees Fahrenheit, but by the afternoon it could be in the lower to mid 70s! The best way to combat this is by wearing multiple layers that you can easily remove and put back on to find your perfect temperature. When layering a good rule of thumb is to make sure that whatever you decide to put on last, it will b the first thing that you’d want to take off! Pro Tip: Start off while still slightly chilly. As you ride, you’ll warm up and that chilliness will go away. However, bring an extra layer incase you stop along the way! You want to stay warm when you’re not riding. Not sure what to do for layering? Check out our article about how to layer, why it’s beneficial, and what to wear. The falling leaves are gorgeous, and leaf piles can be a lot of fun. However, a wet, crunchy leaf pile an be a hazard when riding your bike through it. Not only can water splash upwards onto your bike and legs, but the bike tires can slip on the leaves. When leaves are wet, they become slick or slippery. With a normal bike tire being thinner, it has less surface area for surface tension. If a leaf gives away, or get stuck onto the tire, a bike can slip out from under you. Luckily, if you have a fat bike, this is less of a problem. The larger tires adds more traction to the surface and, therefore, is less likely to slip. Even with the lesser likelihood of slipping, caution should still be used. Also, wet leaf piles can conceal a number of different items. This can include nails, glass, or other objects that can puncture you tires. No one wants a flat while out riding. Sometimes you can’t avoid riding through the piles, but if you can, ride around the leaves. For fall bike riding high visible clothing and saddle bag gear are easier for motorists to see. Dusk is coming earlier and earlier as the season continues on. This means that the evening is intruding on some great riding opportunities in the daylight. While some daylight will be saved temporarily when we fall backwards an hour on November 6th this year, the time change can still negatively affect cyclists. When times change it affects a person’s sleeping routine leading to a lack of sleep. This sleep deprivation makes people less attentive while driving. While November 6th is a Sunday this year you would think that people will most likely sleep in and therefore decrease the number of accidents. However, cyclists and other pedestrians should be aware and be extra cautious that day, and the day following. Why? Because people need time to adjust to the time change. It has been found that there is a significant increase of fatal accidents following the changes in daylight savings time when it occurs on a Sunday or Monday – according to a study done in Sleep Medicine and The Royal Society for the Prevention of Accidents. This means that staying visible is even more important than usual. This isn’t limited to just the morning, but throughout the day whether on the road or trails. You can do this in a couple of ways depending what you are comfortable with doing. Plus, the more you do, the more you increase your visibility. Wearing bright colors will make you stand out. If someone doesn’t see you to begin with, the color will catch their attention and they will find it easier to keep tabs on where you are. On the other hand, wearing dark colors isn’t recommended. Dark colors can blend into the dark and reduce your visibility. Natural colors can also blend you into the background or sidelines making you less visible. When cycling in the early morning before there’s much daylight, or in the evening, reflective clothing is a must. This way, when the headlights on a car shine on you, you’re immediately recognized. For fall bike riding add bike light front and back to be more noticeable. Did you know it’s a law to have lights on your bike? It’s something you have to do, but you should also do it because you’re interested in staying safe. It’s important to note that lights aren’t required for daytime riding. However, since we never know when it might get dark out and we can’t plan for all those times when we end up riding late at night, it’s important to have a light handy. If it’s already attached to your bike, then it’s something you don’t have to worry about! Unfortunately, there are no excuses if you get pulled over by a police officer for riding in dark conditions without one. Every state might have slightly different laws regarding bike lights (with many similarities as well). 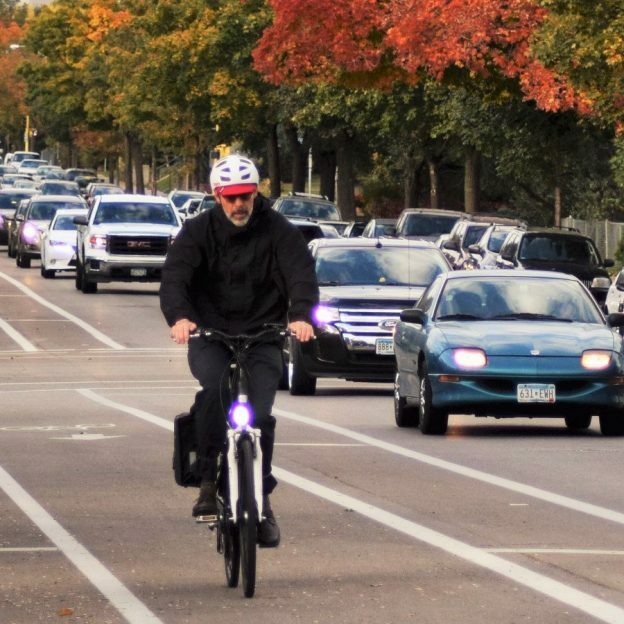 For bike laws and more about lighting in Minnesota, Minnesota Department of Transportation has a condensed document to review. As discussed earlier, leaves can hide different items that can puncture your tire. It’s not always avoidable, so it’s important that you should check your tires occasionally. This shouldn’t be limited to the fall and winter, but should be checked every time before you begin riding. Doing this allows you to catch any problems sooner rather than later. Another thing to check is tire pressure. While fall isn’t as cold as winter, the cold can still alter the tire pressure. So, it’s best to check to make sure that the tire pressure is perfect before going out for your ride. Remember to bring the usual tools that you would usually bring for your bike adventures! In case anything happens, you want to make sure you have all the materials you need to fix it. To know what these are, check out our article about the tools you should have along for any ride. With these tips, you’re sure to have a great and safe extended season as you continue to ride your bike through autumn. Keep safe, have fun, and ride on! This entry was posted in News and tagged #bikelight, #bikelights, #fallcolors, #nextadventure, #nextbikeadventure, #onlyinMN, Bike lights, layered clothing, Minnesota fall colors, Minnesota trails, neon colored clothing, reflective clothing, visible bicycle clothing, wicking cloths, Wicking fabrick on October 20, 2016 by Jess Leong. With the summer season officially off the calendar, fall is a great time to extend your bike riding adventures here in Minnesota. As the trees change colors along the miles of paved and mountain bike trails, cyclists will find a kaleidoscope of colors along the way. With the abundant rainfall this year, colors are predicted to be spectacular. If the weather remains mostly sunny during the day and cool at night, conditions will favor a stunning ride while exploring Minnesota. So, it’s no surprise that Minnesota’s peak riding time is fall. Each year the fall color peak normally arrives in the northern one-third of the state in mid-September to early October. For the southern-third of Minnesota, colors peak early to mid-October. This year the peak cycle, statewide, is running a week or so later than normal due to ideal summer conditions – so enjoy! To get a more accurate gauge to the change in colors in areas of Minnesota that you would like to visit, a color report is available online or through a weekly e-newsletter from Explore Minnesota Tourism each Thursday afternoon during the fall season. This section is the final section, part three of a three part series about Minnesota’s peak riding times. Click here on Part Two for Central Minnesota and Part One for Northern Minnesota Trails and Fall Colors. Cannon Valley: This 19.7 mile trail between Cannon Falls and Red Wing is a popular Rail-to-Trails attraction here in Minnesota. It’s a beautiful, shady ride above the Cannon River with a picnic area in Welch, its midpoint. It is maintained by a trail association and there is a daily fee of $3. See more at Cannon Falls Tourism at the west trailhead and Red Wing Tourism at the east trailhead, near the Mississippi River. Douglas: This is a 12.5 mile rolling trail ride through rolling farmland between Pine Island’s city park and the north outskirts of Rochester. For more information see Rochester Tourism. 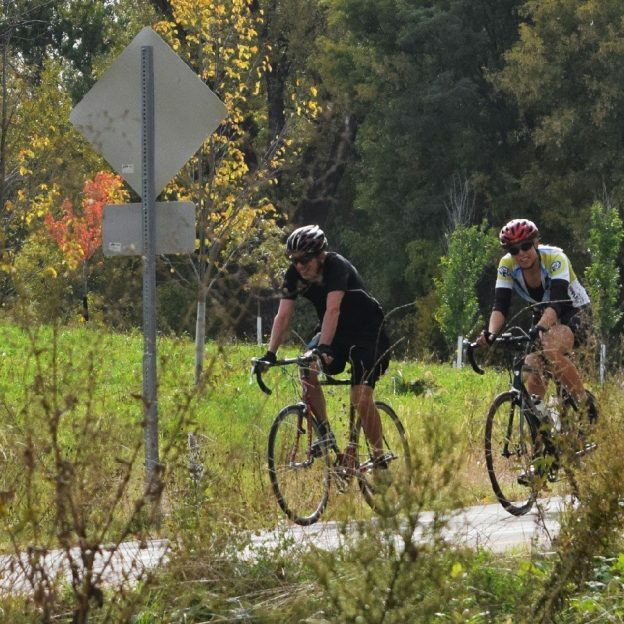 Great River Ridge: This 13 mile paved trail connects the southeast Minnesota towns of Plainview, Elgin, and Eyota and is near Whitewater and Carley state parks. The first half follows a winding creek. Also, the five miles from Elgin to Plainview are slightly uphill and follow the highway. See more at: Plainview/Elgin/Milleville Tourism. Shooting Star: This 22 mile trail follows the Shooting Star Scenic Byway from LeRoy to Austin. LeRoy is on the Upper Iowa River near the Iowa border and continues towards Austin, just south of I-90. Then, at the eastern half, the trail goes through Lake Louise State Park. After passing through Adams and Rose Creek, the trail rolls in to Austin’s bike-friendly atmosphere. See more at: Austin Tourism. Winona’s Trails: The terrain around Winona is looped by spectacularly beautiful bicycle trails aimed at a variety of riders. Whether you are out for a scenic ride with the family on the 5 mile paved trail around the lake or the bike-friendly street routes in town, there are great backgrounds. The Mississippi River Trail leading in and out of Winona will have colors that can add excitement to your adventures and memories, and this is even true if you decide to sample the mountain bike trails here. For more, see: Winona Tourism. Root River/Harmony-Preston Valley: Between Fountain and Houston, the 42 mile Root River Trail, in the lovely bluff country, is one of Minnesota’s pride and joys. Add the 18 mile Harmony-Preston trail, from Isinours Junction, just west of Lanesboro on the Root River State Trail, riders on this section will enjoy rolling terrain up to the farm town of Harmony. For more, see Root River Trail Towns Tourism. Blazing Star: This paved trail currently runs from Albert Lea Lake, in Albert Lea, to Myre-Big Island State Park. The total trail distance is approximately 20 miles. Along the route you can enjoy the natural environment that includes wetlands, oak savanna, big woods, and prairie. Also, the park is a great birding spot, especially during fall migration. See more at: Albert Lea Tourism. 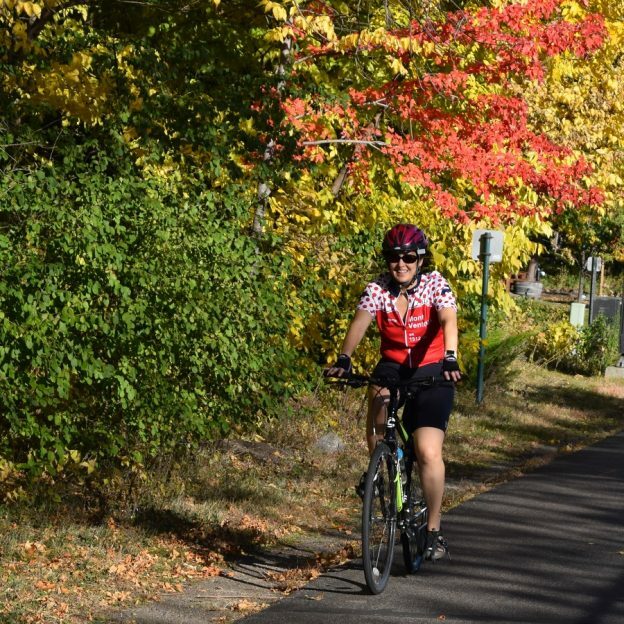 Red Jacket: This 19 mile trail system connects Mankato’s South Riverfront Drive to Rapidan. Then, it goes to the South Route Trail and to Minneopa State Park. Interested in connecting from the Red Jacket to the Sakatah Singing Hills State Trail? It is about four miles on the Minnesota River Trail. For more, see: Mankato Tourism. Sakatah Singing Hills: This low-profile, 39 mile trail between Faribault and Mankato has a mixture of scenery. It periodically plunges into cool woods, passing Sakatah Lake State Park (Sakatah is Ojibwe for “singing hills”. This is pronounced Sah-KAH-tah) and Elysian. Then, if you’re lucky, you will get to see flocks of pelicans that hang out on Lake Elysian. For more see: Faribault Tourism at the east trailhead and Mankato Tourism on the west side. Even on off-road trails, bicyclists need to wear helmets. It’s important! Why? You are much more likely to fall on your head by locking wheels with another bike or by stopping suddenly than you are to be hit by a vehicle. Also, don’t forget to stop at stop signs on the trail, even if it’s just a driveway or gravel road. Have Fun and check back this Thursday for part three of Minnesota’s Peak Riding Time! This entry was posted in News and tagged #fallcolors, #nextadventure, #nextbikeadventure, #onlyinMN, Cannon Valley Trail, Minnesota bike maps, Minnesota fall colors, Minnesota trails, MN trails, Red Jacket Trail, Root River Trail, Sakatah Singing Trail on October 16, 2016 by Jess Leong. With the summer season officially off the calendar, fall is a great time to extend your bike riding adventures here in Minnesota. As the trees change colors along the miles of paved and mountain bike trails, cyclists will find a kaleidoscope of colors along the way. With the abundant rainfall this year, colors are predicted to be spectacular. If the weather remains mostly sunny during the day and cool at night, conditions will favor a stunning ride while exploring Minnesota. It’s no surprise that Minnesota’s peak riding time is in the fall and now. Each year the fall color peak normally arrives in the northern one-third of the state in mid-September to early October. This year the peak cycle, statewide, is running a week or so later than normal due to ideal summer conditions – so enjoy! This section is part two of a three part series. 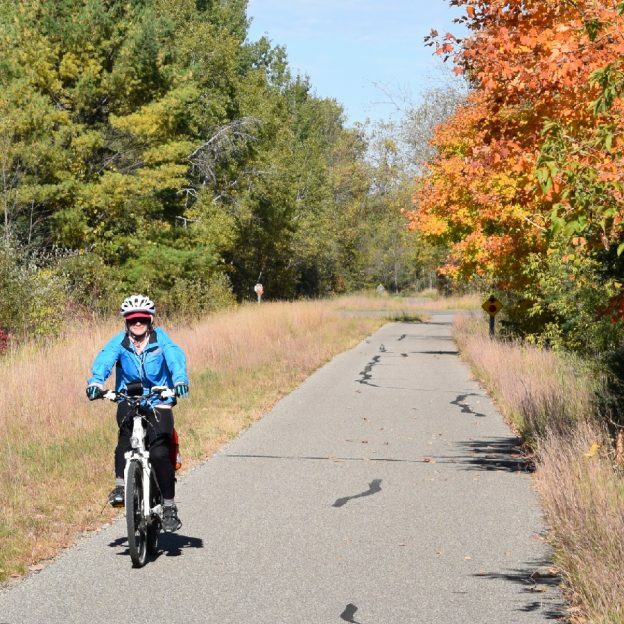 Central Lakes: This trail offers 55 miles of pedaling opportunities through rolling landscapes. It provides cyclists with views of the many lakes and countryside from Fergus Falls to Osakis. Then, it is at Osakis where it connects with the Lake Wobegon Trail. See more information on the Central Lakes Trail here. Glacial Lakes: This scenic trail through the Little Crow Lakes region starts at the Civic Center at the northeast edge of Willmar and winds 22 miles northeast, passing the big, festive beach on Green Lake in Spicer, then New London and Hawick. Then, from New London, cyclists can ride three miles west to Sibley State Park. See more information at: Willmar Tourism. Lake Wobegon: Offers 46 miles between St. Joseph (just west of St Cloud), up to Osakis where the trail connects to the Central Lakes Trail. Along the way, the main section of the Lake Wobegon passes a series of picturesque old churches. These churches are in the towns that inspired the stories of Garrison Keillor. Then, in Albany, a spur extension allows cyclists the option to travel north up through Holdingford. Then, cyclists can go across the Mississippi River to U.S. Hwy 10 just below Little Falls. See more information on visiting the Wobegon Trail at: Granite County Tourism. For the north spur section see: Little Falls Tourism. Luce Line State Trail is a 63 mile long former rails to trail route that starts in the Plymouth and for 30 miles west it is a limestone surfaced trail that runs out to Winsted. From Winsted to Hutchinson the trail is paved, See more at: Hutchinson Tourism. Prairie Waters: In this area, in the Upper Minnesota River Valley, there are miles of quiet country roads to see the fall colors. Also, taking these trails allows spectacular wildlife viewing opportunities. Plan a bike trip around Lac qui Parle Lake, or travel on the Minnesota River Valley National Scenic Byway roads. Here, in this four county area, many of the route loops allow you to ride past wildlife refuges and parks for bird viewing and historic points of interest. Additionally, several of the Prairie Water cities also offer paved trails for family fun, in addition to trails for mountain biking. See more at: Prairie Waters Tourism. Gateway/Brown’s Creek: This trail is a recreational jewel of the East Metro Area of the Twin Cities. The Gateway section runs 18 miles from Lower Downtown St. Paul to Pine Point Park. The recently acquired 5.9 mile Brown’s Creek Trail connects before Pine Point Park on the Gateway Trail. 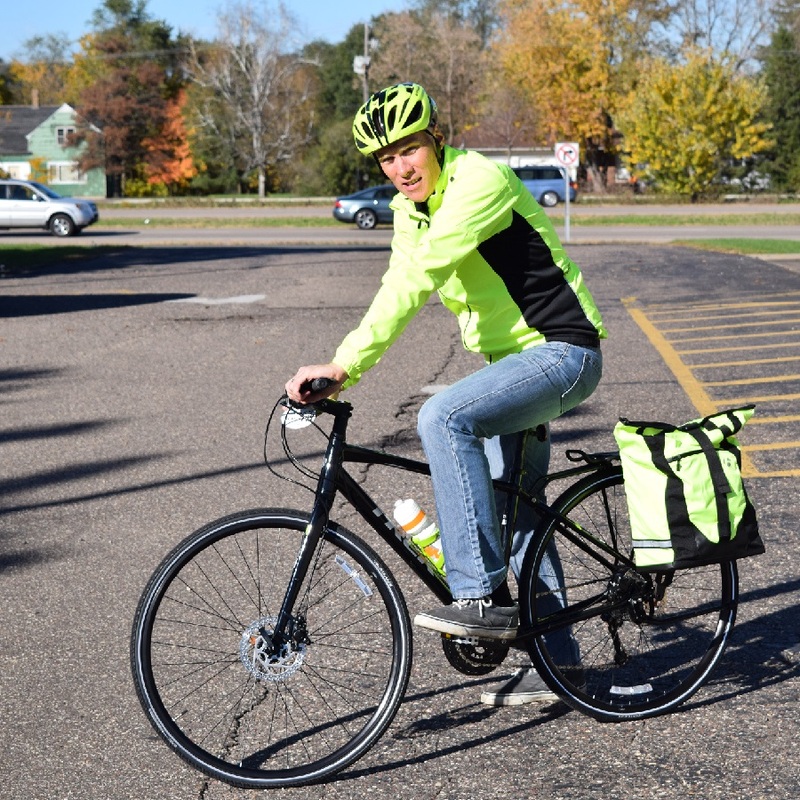 This enables trail users to go to the scenic St. Croix River Valley, in downtown Stillwater. See more about this area at: Stillwater Tourism. 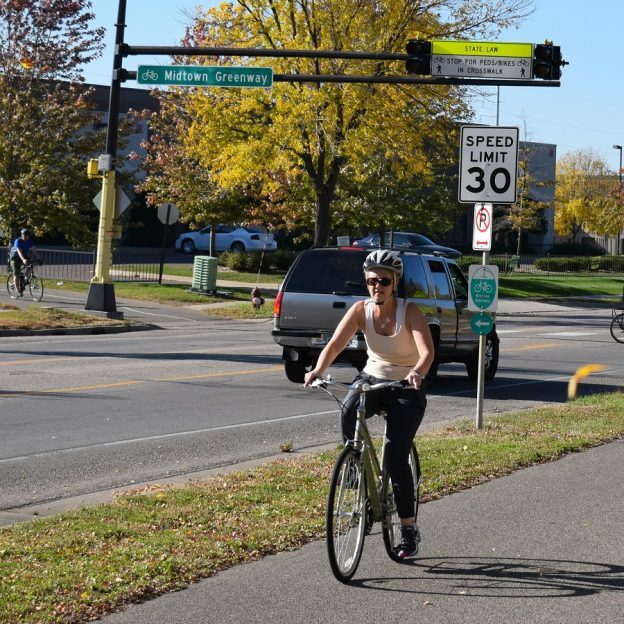 Grand Rounds: This national scenic byway through Minneapolis includes 51 miles of bicycle trails. Since these trails go around the lakes and along Minnehaha Creek and the Mississippi River, they can be extra fun. See more at: Minneapolis Tourism. Lakeville Trails: On the southern edge and close to many Twin Cities attractions, Lakeville is a family friendly mecca for bicycling trails. And, it’s also great for fall color scenery. With more than a 100 miles of paved trails, many parks and several great road routes, both visitors and residents alike will find plenty of safe riding opportunities here. See more information at: Lakeville Tourism. Minneapolis Northwest: At the northwest corner of the Twin City Metro Area is Brooklyn Center, Brooklyn Park and Maple Grove offer a huge number of trails that connect to other metropolitan communities, Elm Creek Regional Park and the Mississippi River Trail, See more information at: Minneapolis Northwest Tourism. 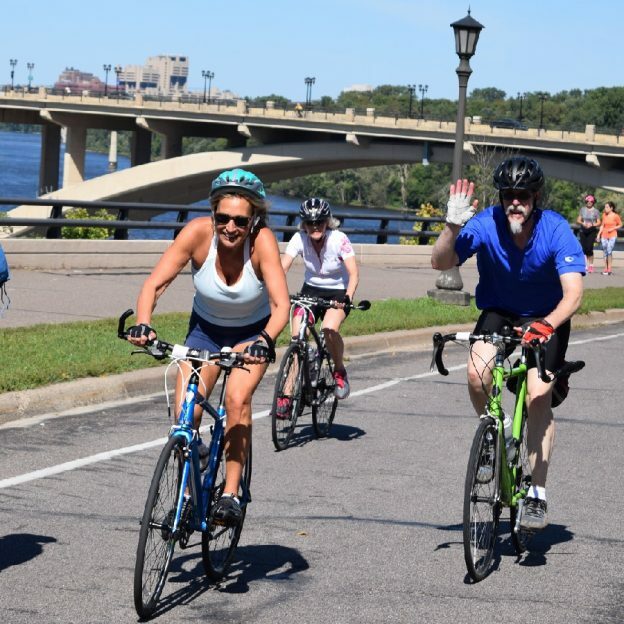 Twin Cities Gateway: Situated on the north side of the Mississippi River from Downtown Minneapolis, the Anoka County Gateway Trails offers families and touring cyclists hundreds of miles of paved trail to grasp all the river valley colors at their peak. See more at: Twin Cities Gateway Tourism. Even on off-road trails, bicyclists need to wear helmets. Since you are much more likely to fall on your head by locking wheels with another bike or by stopping suddenly than you are to be hit by a vehicle, keep on those helmets! This entry was posted in News and tagged #fallcolors, #GatewayTrail, #nextadventure, #nextbikeadventure, #onlyinMN, Central Lakes Trail, Glacial Trail, Lake Wobegon, Minnesota bike maps, Minnesota fall colors, Minnesota trails, MN trails on October 13, 2016 by Jess Leong. With the summer season officially off the calendar, fall is a great time to extend your bike riding adventures here in Minnesota. As the trees change colors along the miles of paved and mountain bike trails, cyclists will find a kaleidoscope of colors along the way. With the abundant rainfall this year, colors are predicted to be spectacular. If the weather remains mostly sunny during the day and cool at night, conditions will favor a stunning ride while exploring Minnesota. It’s no surprise that Minnesota’s peak riding time is fall. Each year the fall color peak normally arrives in the northern one-third of the state in mid-September to early October. Granted, there is an exception to that rule if you are looking at biking in the Arrowhead region along Lake Superior. If you are, then the peak fall colors normally arrive about a week later than inland areas due to the warming effect of the lake. In the central one-third of the state, wooded areas become colorful between late September and early October. For the southern-third of Minnesota, colors peak early to mid-October. This year the peak cycle, statewide, is running a week or so later than normal due to ideal summer conditions – so enjoy! This section is part one of a three part series. Gitchi-Gami: This trail along the North Shore now has a 29 mile segment. This segment goes from Gooseberry Falls State Park through Split Rock Lighthouse State Park to Beaver Bay. For more information on visiting the area see Heart of the Northshore Tourism Association. Mesabi: This is one the most interesting trails in the state with 120 miles completed so far between Grand Rapids and Virginia/Biwabik. Built only partly on old rail lines, it dips and climbs around bogs and mine-pit lakes. Then, it continues around slag heaps and natural lakes highlighted by aspen and pines. See more at Grand Rapids Tourism on the west end and the IronTrail Tourism for the east end of the trail. Willard Munger: This 75 mile trail between Hinckley and Duluth is one of the oldest and longest paved trails in the nation. The trail starts in Hinckley, Minnesota 61 and then goes to Carlton. For more information on the south end of the trail see: Hinckley Tourism and at the northern end. For near Jay Cook State Park, see Carlton Tourism. Sunrise Prairie/Hardwood Creek: These county trails, just north of the Twin Cities and parallel of Interstate 35W, starts from Washington County’s Hardwood Creek Regional Trail at Forest Lake. Then, the trail changes to Sunrise Prairie Trail at Stacy for another 16 miles up to North Branch. See more information at Sunrise Trail Prairie Trail or Hardwood Creek Trail. Paul Bunyan: This 120 mile trail winds through lake country from Brainerd/Baxter to Bemidji. The southern trailhead is in Baxter, off Minnesota 371 at Excelsior Road (parking is near Northland Arboretum). The trail takes you up through the Chippewa National Forest then to Akeley (7¾ miles to Walker on the Heartland Trail). Afterwards, the trails continues onto Bemidji. Then, it goes to Bemidji State Park. See more information on the south end of the trail at Brainerd/Baxter/Nisswa Tourism and Bemidji Tourism at the north trailhead. Heartland: There are lots of towns to explore on this 49 mile ride. The trail takes you between Park Rapids to Cass Lake, through Walker and connects to the Paul Bunyan Trail. For At-a-Glance Tips see: Leech Lake Tourism on the east end and Park Rapids Tourism at the west end of this trail. Migizi: This scenic U.S. Forest Service loop ride around Pike Bay is 17 miles if you count the spur to-and-from Norway Beach Recreation Area on Cass Lake, streets in the town of Cass Lake, and the three miles that run south of Cass Lake along Minnesota 371. See Cass Lake Tourism for more information. Always check the MnDNR website for a trail map or to see if road construction or flooding has closed a portion of that area. Also, each Thursday afternoon during the fall season a color report is available online. You can also receive it through a weekly e-newsletter at Explore Minnesota Tourism. 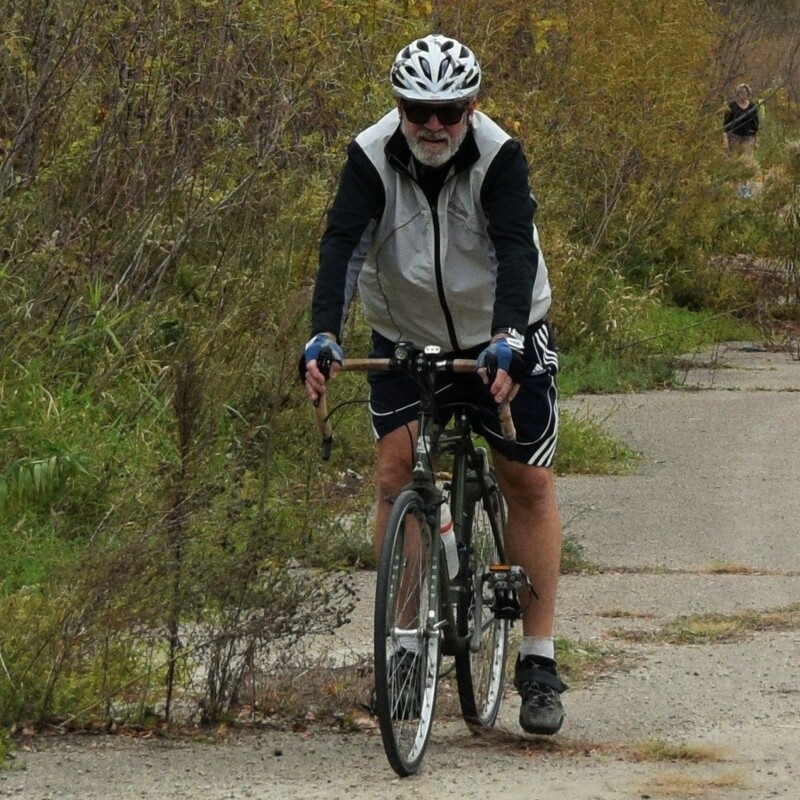 Even on off-road trails, bicyclists need to wear helmets. Since you are much more likely to fall on your head by locking wheels with another bike or by stopping suddenly than you are to be hit by a vehicle, make sure to wear helmet. Don’t forget to stop at stop signs on the trail, even if it’s just a driveway or gravel road. Also, ride with a buddy, especially on isolated stretches. Have Fun and check back this Thursday for part two of Minnesota’s Peak Riding Time! This entry was posted in News, Picture of the Day and tagged #fallcolors, #nextadventure, #nextbikeadventure, #onlyinMN, Gitchi-Gami Trail, Heartland Trail, Mesabi trail, Minnesota bike maps, Minnesota fall colors, Minnesota trails, MN trails, Paul Bunyan Trail, Willard Munger Trail on October 11, 2016 by Jess Leong. The fall colors make the bike commute home in the Twin Cities more enjoyable. 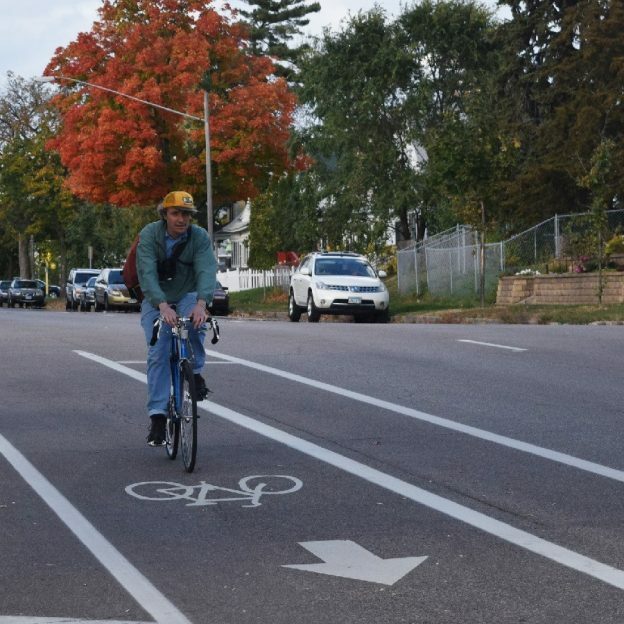 Here in this photo, we captured this cyclist unwinding as he road his bicycle on the designated bike lane on Portland Avenue, in Minneapolis, MN. With the leaves turning and perfect weather today, we hope you get out on your bike and enjoy a fall riding possibilities in Minnesota. See many more bike friendly places to explore in the new Minnesota Bike/Hike Guide. Thanks for viewing the Bike Commute of the Day. This entry was posted in News, Picture of the Day and tagged #moveminneapolis, #nextadventure, #nextbikeadventure, #onlyinMN, Bike commuting, Minneapolis bike lanes, Minnesota bike maps, Minnesota fall colors, Road biking Minneapolis, Road Biking Minnesota on October 11, 2016 by Jess Leong.